Boycott Israel News: H&M Whitewashing Israel's Colonization of Jerusalem, BDS National Committee calls for Boycotting H&M! The Palestinian Boycott, Divestment and Sanctions National Committee (BNC) calls for international protests leading to a boycott of Swedish fashion giant H&M, particularly in the Arab World, in response to its opening of its second store in Israel, this time in the "Malha Mall" in Jerusalem, at a time when Israel is intensifying its illegal colonization of the occupied eastern part of the city. Malha is one of the Palestinian villages that were ethnically cleansed during the 1948 Nakba and whose original Palestinian inhabitants are refugees denied their UN-sanctioned right to return to their lands. Israel, to this day, continues its policies of ethnic cleaning in Jerusalem by evicting Palestinians from their homes and replacing them with Jewish colonial settlers and by constructing tens of thousands of housing units for those settlers in the occupied Palestinian territory. 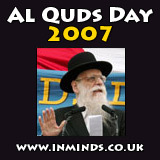 All Israeli colonies are regarded as war crimes under the Fourth Geneva Convention. In addition to opening stores in Tel Aviv and Jerusalem, H&M has announced its decision to open additional stores in Haifa, Petah Tikva, Netanya, and Rehovot . While H&M is clearly not the only international chain that is operating in Israel, its decision to invest substantially in Israel after its criminal war of aggression on Gaza and in the midst of its intensified colonization of Jerusalem in contravention of international law can only be understood by Palestinians and supporters of just peace around the world as a form of support for Israel’s abhorrent violations of international law and human rights. H&M claims to adhere to the UN Global Compact, a corporate social responsibility initiative that obliges it to ensure it is "not complicit in human rights abuses" . The UN's Goldstone report has recently condemned Israel for committing not just grave human rights abuses but also war crimes and possible crimes against humanity during its Gaza massacre. By ignoring this and investing heavily in Israel's economy at this time, H&M is violating its own commitments to the UN's principles of ethical investment. Solidarity activists in London picketed H&M's flagship London store on Saturday, 13 March, and gave shoppers information about the Palestinian call for BDS. 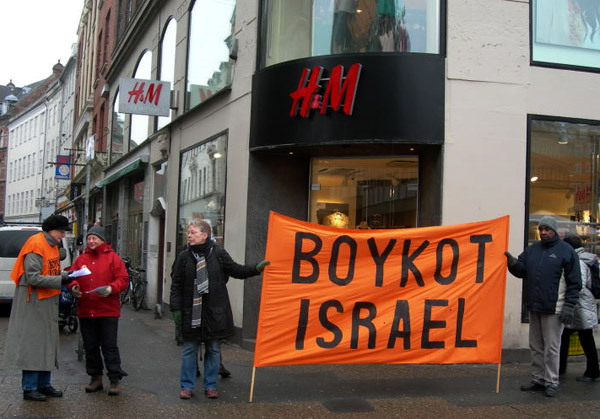 Groups in H&M's native Sweden also picketed stores and called on the firm, which made profits of USD 2.2bn in 2009, to end its Israeli operations . It is worth mentioning that Sweden and other Scandinavian countries have taken serious measures in the last few years to exclude companies implicated in Israel's occupation and illegal building of colonies and the Wall from their pension funds . Most recently, Danske Bank, the largest in Denmark, decided to divest from Elbit Systems and other Israeli companies involved in systematic human rights violations. 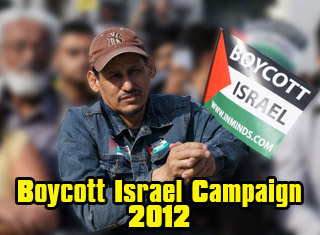 The BNC calls on solidarity organizations and people of conscience around the world, particularly in Arab states, to escalate their civil protests against H&M, reaching a total boycott of the chain, until it has ended its complicity in Israel's system of occupation, colonization and apartheid against the Palestinian people. Conducting business as usual with Israel is not only unethical; it is detrimental to the pursuit of a just peace based on international law. Responding to the Palestinian BNC call for protests against Swedish fashion giant H&M after it opened stores in Israel, activists targeted the opening of a new H&M store in Brixton with protest inside the shop and pickets outside.